You’re very welcome. I really enjoy working with both you and your wife. Everything worked well, and I recvd. my new lower cost home insurance policy. You have done a fine job and I appreciated your help. 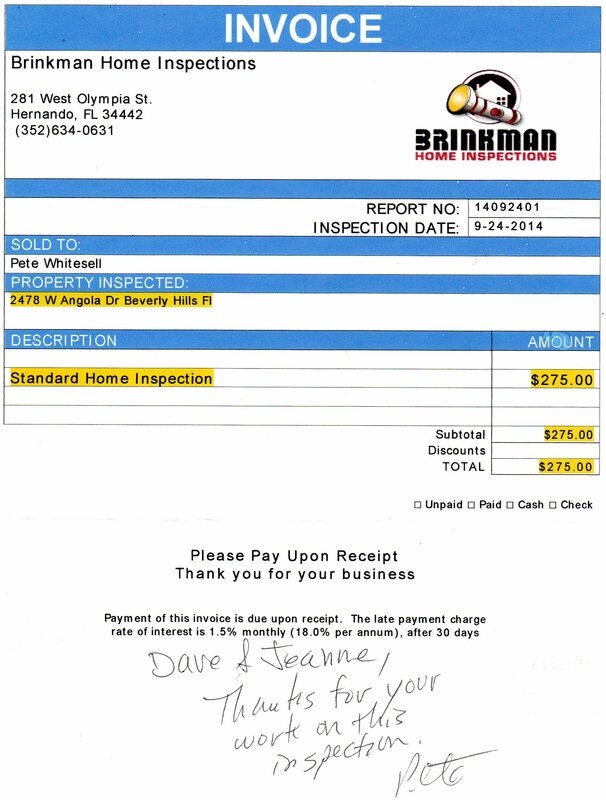 That is the best, concise, non-scarey, thorough inspection I’ve had the pleasure to review! Thank You. Many thanks to you & Jeanne, Dave! I appreciate your fitting us in to scheduling & for your careful & informed reporting! Thank you for the thorough inspection reports. I feel satisfied that I am buying a very good home. I would recommend your services. It was a pleasure doing business with you and nice meeting you both. Thank you so much for your excellent work. My boyfriend Gary was really impressed with everything you and your wife did for the inspection. We went out with friends that evening and he raved to everyone about your work. This is my first time buying a house by myself and it is such a huge relief knowing everything has been checked out. I will definitely recommend you to friends! Have a great weekend. Thank you again for coming out this morning. We appreciate all your support. Do you mind writing a statement about your findings today for the mortgage company? the pleasure was all mine. I really appreciate you and your wife’s work. I also received the invoice and agreement on your last email just so you know. I will definitely recommend your services to my friends that are thinking of moving to the area. Have a wonderful day. Hopefully we will be in the house and closed by Thanksgiving. Thank you so much for the prompt and efficient report. You are a joy to work with. Thank you Dave , I appreciate your prompt and professional service. It was a pleasure sir. Thank you again. That is fine. We are buying the house. Thanks for your awesome report. With the detailed report, we were able to renegotiate the price. We just want to see what we bought thru your pics. Enjoy your vacation. Hey Dave: Everything worked well, and I recvd. my new lower cost home insurance policy. I have been burned by home inspections in the past, therefore, my natural suspicion should be understood.